As one of the network engineers of the network you are responsible for all DHCP related configurations. In this scenario there is one DHCP server that is configured to supply IP addresses for the 192.168.12.0/24 and 192.168.23.0/24 subnet. However both clients are not receiving any IP addresses…up to you to find a solution! All required IP addresses have been preconfigured as specified in the topology picture. Router DHCPClient1 needs to get an IP address through DHCP on its fa0/0 interface. Router DHCPClient2 needs to get an IP address through DHCP on its fa0/0 interface. Only router DHCPServer has to supply IP addresses. You will learn all the secrets about troubleshooting DHCP and more. Have you the answered please? first of all Hello everyone, and of course thanks goes to Rene on great labs. This was my solution, ensure ip dhp service is enabled on the DHCP server and also check you have the appropriate default-routers configured for each pool. I’d also suggest using the ip helper address on Client1 because routers do not pass on broadcasts by default. I also configured static route to 192.168.23.0/24 so that the DHCP server could ping Client2. It all seems to be working fine. When doing this lab you could also use debug ip dhcp server packet as this produces some useful information. Why would you enable routing on a client?!? A client normally means a PC and PCs don’t route traffic. 1. Start dhcp server with "service dhcp"
2. Configure 192.168.12.1 and 192.168.23.2 as default routers in seperate pool configurations. 3. Write a static route on server for 192.168.23.0/24 network. 4. On fa 0/1 of Client1 keep "ip helper-address 192.168.12.1". Seftera you forget to add ip dhcp exclude-address 192.168.23.1. If you see the drawing it clearly says DHCPClient2 needs a 192.168.23.3 address. With the current setup, it will be assigned a .1 by DHCP. I haven’t actually done this lab yet but by the looks of it seems pretty straight forward. the DHCP server with excluded addresses for cl 1 and 2. 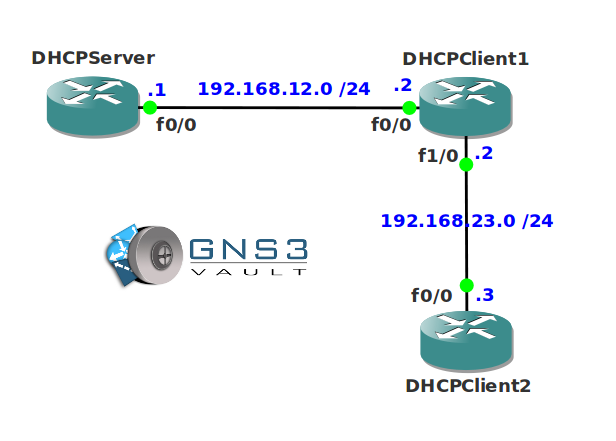 DHCP pools for both clients. Client 1 will be the DHCP relay agent for client 2. Make sure you setup independent pools for cl1 and 2 or else you’ll have issues. I would use a routing protocol over static routes, but it’s your call. Why? Because, in case of outgoing interface, router will broadcast ARP requests for each and every new destination address of the packets to be forwarded. This puts strain on CPU! Also, note, that if on the other end there is no proxy-arp running, then you will end up with blackhole, since no reply will be received for the ARP requests (except for the packets, destined for that particular connected network, e.g. 192.168.12.0/24 in our case). Good post. Also, it is possible to use BOTH at the same time. If you use both, you make the FIB do a tiny bit less work (debug ip cef events, I think the command is) since it does not need to dynamically determine the outgoing interface. Hello guys, it is simple but tricky somehow! Is there a way to see if service dhcp is running? sure; use “show ip sockets” command on the server; if you don’t see a port number of 67 it means the dhcp service isn’t running. Yes indeed an odd one. Now, this lab matches perfectly with scenarios in TSHOOT FLG book from Ciscopress, several things to watch out for. some hints includes using [DEBUG IP PACKET] on clients. [SHOW IP SOCKETS] [DEBUG IP DHCP SERVER packets/events] i can also recomend sniffing on the wire between routers to see whats going on and what doesn’t. do bottom up troubleshooting could also help. Think packetflow! On the dhcpserver, turn on service dhcp, and exclude addresses, 192.168.12.1 and 192.168.23.1 through 192.168.23.2 . Next on DHCPClient1 f0/0 and DHCPClient2 f0/0 add ip address dhcp. Next on all router’s turn up all down interface’s. Next install the ip helper address (192.168.12.1) on DHCPClient1 f1/0. Next turn on ospf on all routers. Or put in static routes on all router’s. Now check DHCPClient1 for adj to both DHCPServer and DHCPClient2. If adj good, go to the DHCPServer and do a show ip dhcp binding then ping 192.168.23.3 . Done! Good lab, I learn a lot.